At Gaughf Dermatology, we believe that early diagnosis and rapid treatment are the keys to effective management of skin cancers. We highly recommend every patient schedule an appointment for a complete body skin examination yearly. Develop a regular routine to inspect your body for any skin changes. People who spend a lot of time outside, have used tanning beds, or have received multiple sunburns before age 18 are at increased risk for skin cancer as well as people with fair skin, hair, and eyes and those who sunburn easily. Skin cancer may also be hereditary. If a growth, mole, sore, or skin discoloration appears suddenly or begins to change, you should schedule an appointment. Early detection is the key. 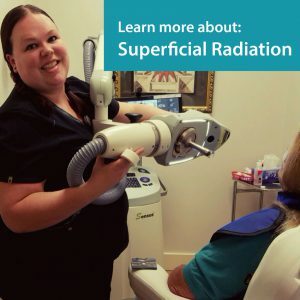 Dr. Gaughf and her physician assistants are experts in the identification and treatment of skin cancers. Malignant melanoma is the most deadly of all skin cancers. Each year, more than 8,000 Americans will die from melanoma. It is projected that more than 100,000 Americans will develop melanoma annually. Melanoma may appear suddenly or may begin in or near a mole or another dark spot in the skin. It is important to know the location and appearance of the moles on the body to detect changes early. This skin cancer often appears in mixed shades of tan, brown, and black; although, it can also be red or white. Melanoma can also appear as just a very small black spot and sometimes does not have variations in color. Look for the appearance of any moles that are very dark compared to your other moles as well as the warning signs listed below. A dermatology provider must examine any changing mole. Melanoma is curable when removed in an early stage. Melanoma readily metastasizes making early detection and treatment essential to increase survival rates. Dark skin is not a guarantee against melanoma. People with skin of color can develop melanoma, especially on the palms, soles, under the nails, in the mouth, or on the genitalia. Basal Cell Carcinoma is the most common form of skin cancer. Basal cell carcinomas are more common on areas of the skin that have been exposed to the sun but can occur anywhere on the body. It may appear as a red sore, red patch, smooth bump, bleeding lesion or a spot that will not heal. These are highly unlikely to spread to other areas of the body. However, many patients have multiple basal cell carcinomas over different parts of the body. Squamous Cell Carcinoma is the second most common skin cancer. These can appear as a rough, red, scaly patch or can also appear as a quickly growing nodule. When diagnosed early squamous cell carcinoma has a high cure rate but if left untreated they sometimes can be deadly. A suspicious mole or skin lesion may be removed and biopsied. If a skin biopsy reveals cancer, we can choose from an array of the most-advanced medical treatments and surgical procedures available today depending upon the type of cancer, its location, size and what would be most appropriate for the particular individual. 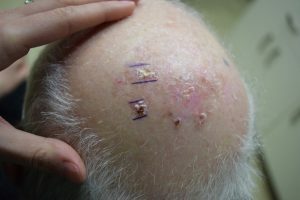 Frozen Excision – For select skin cancers Dr. Gaughf excises the tissue for immediate pathology results the same day. Electrodessication & Currettage – Destruction of the skin cancer without sutures using a scrape and burn method. A keratoacanthoma is a skin lesion that quickly erupts on sun damaged skin, much like a volcano. They may start due to a minor injury on sun damaged or hair bearing skin. They arise from hair follicle skin cells for unknown reasons. Initially it may appear like a small pimple or boil then quickly enlarge. Keratoacanthoma is considered to be a variant of squamous cell carcinoma skin cancer. Most commonly these are treated surgically. These are precancerous small, rough areas usually found on areas of the skin that have been exposed to the sun over time. They may be slightly discolored or may be the same color as the skin and may have a scaly surface. They are often easier to feel than to see. Untreated, these may develop into Squamous cell carcinoma.